About ten years, it seemed kale was really just a piece of greenery used as garnish or to fluff up the surroundings of a salad bar. Somewhere along the way, however, people noticed its unique flavor and intense nutrient content, and kale exploded into the poster child for super foods that we know today, with lots of different varieties, colors, textures, and flavors, and a vast number of ways to prepare it. One of the more unique and versatile ways (and my personal favorite!) to prepare kale is to massage it with lemon juice and sea salt. This mixture tones down the sharp, bitterness of these leafy greens and brings out their juicy, rich flavor. I also love this way of preparing kale because, as you’ll see in the photos below, it’s a great way to turn a ton of kale into a very small, delicious pile. I rarely measure anything when cooking, so keep in mind that this recipe is very flexible, very forgiving, and you can add in just about anything. You simply need to start small and slowly add the ingredients to your preferred taste. This kale salad can go a number of ways: I’ve even added grilled chicken, olives, cranberries, etc. and it’s always been tasty. I have used this salad as a full meal, or as a side along with some rosemary potatoes and a piece of fish. The bright, tangy, sweetness of it pairs well with a cold white wine, and is perfect even by itself as some healthy fuel for after the gym. 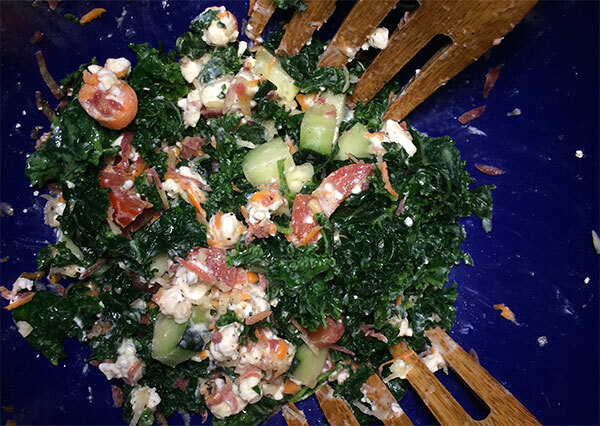 Try variations, enjoy this easy way to reduce a ton of kale to a delicious, manageable pile, and keep sharing your ideas. This flavor-packed, nutrient-dense salad is sure to put a big fat ’S’ on your chest and give you all the energy you need to power through your day like a superhero. Enjoy! Shine on. 1 bunch kale (you can work with the amount you have, but keep in mind that the kale will wilt down, so a huge bunch will be reduced to a very small pile). 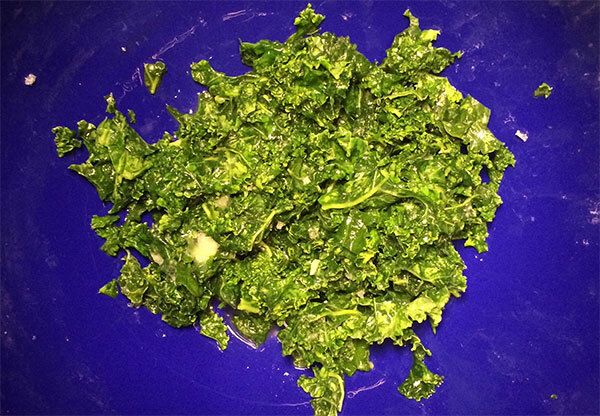 Rinse and de-stem the kale, chop loosely, and place into a very large mixing bowl. Squeeze a few wedges of lemon atop the kale pile. Sprinkle a few pinches of sea salt over the kale and begin massaging. 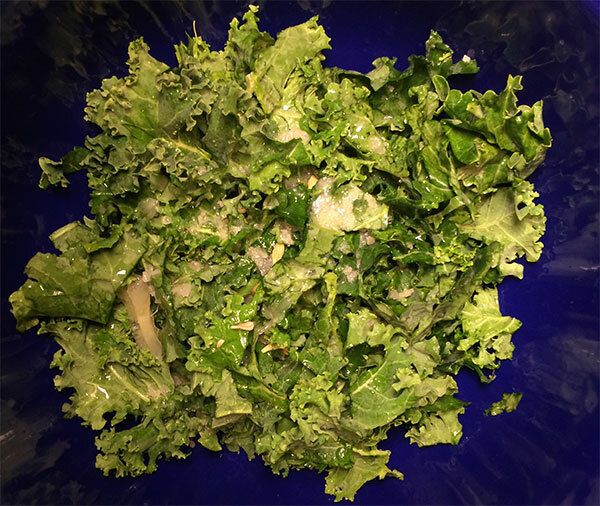 The combination of lemon juice, sea salt, and massaging with your hands will begin to wilt and soften the kale, release its juices, and reduce it to a small pile. Special note: It is very easy to overdo it with the lemon and sea salt, making the salad pretty sour. Start with small amounts and frequently taste little pieces, adding more lemon juice and sea salt until you have the preferred flavor. Rinse and dice cucumber and tomato—add to bowl (the party is just beginning and the salad will start to look colorful and chock-full of awesomeness. With your half avocado still in skin, slice vertical lines into the flesh, then horizontal lines making a grid shape. Squeeze the skin to release tiny cubes of avocado into the bowl. Grate the carrots over the bowl or simply slice them if you don’t have a grater. Add crumbled goat cheese and sprinkle with black pepper. Toss the salad a few times to mix the ingredients, serve chilled, and enjoy!